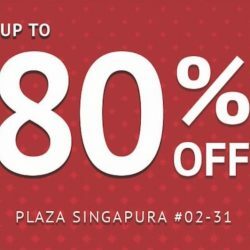 Goldlion is having a Super Sale at their Plaza Singapura with up to 80% off mens apparel and leather accessories! Limited time only, while stocks last. 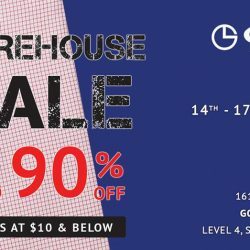 GOLDLION Warehouse Sale is happening from 14th to 17th June 2018, Thursday to Sunday! Grab great deals with all items going at up to 90% OFF, at prices $10 & below. Items include various apparel & leather accessories. Been collecting your fair share of Pokemon? 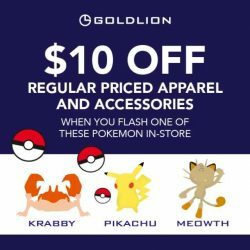 Get $10 off regular-priced GOLDLION Apparel or Accessories items, whenever you flash one of these Pokemon characters in any of our boutiques. Valid till 30 September 2016. Terms and conditions apply. 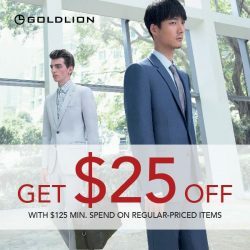 Visit any GOLDLION boutiques to enjoy $25 OFF* your purchase with a minimum spend of $125 on regular-priced products. Hurry, valid from now till 30 Sept ‘16! It’s Singapore’s 51st Birthday month! 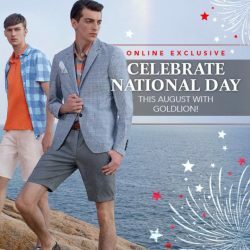 To celebrate, GOLDLION is running a special promotion online for the whole month of August! Get $20 off when you spend a minimum of $100 nett, online. Head over to http://bit.ly/GLAUG20 this August for the promotion of the month! 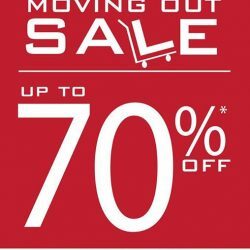 Goldlion: Enjoy up to 70% off at Jurong Point Moving out sale! Head down to GOLDLION Jurong Point Accessorieshop (#02-43) to enjoy up to 70% off* in our moving out sale! Find us at Jurong Point #02-14/15 from 25 August 2016 onwards. The end of the month is approaching FAST! Less than SEVEN DAYS LEFT till “50% off your second item” GSS sale ends! Hurry! Head over to a GOLDLION store near you before it ends. 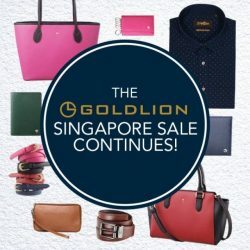 The GOLDLION Singapore Sale is still ongoing! Shop now at http://bit.ly/30for2x and enjoy 30% off with any 2 items purchased. Save time by skipping the queues and avoiding the crowds! Shop at our GOLDLION online store and enjoy 30% off with any 2 items purchase, as well as FREE shipping when you spend $40 or more.